Creepy but lovely chocolate cupcakes for the trick or treaters! SIFT the flour and cocoa into a large bowl, add the butter, sugar, vanilla, eggs and milk and mix to combine. Spoon the mixture into 12 x 1/3 cup capacity paper lined muffin pans. BAKE in a moderate oven 180°C for 20 minutes or until cooked when tested. Cool on a wire rack for 10 minutes before turning out of pan to cool completely. Store in an airtight container until required. COMBINE the PHILLY and chocolate in a bowl and stir over gently simmering water until smooth. Allow the mixture to cool until firm enough to pipe. 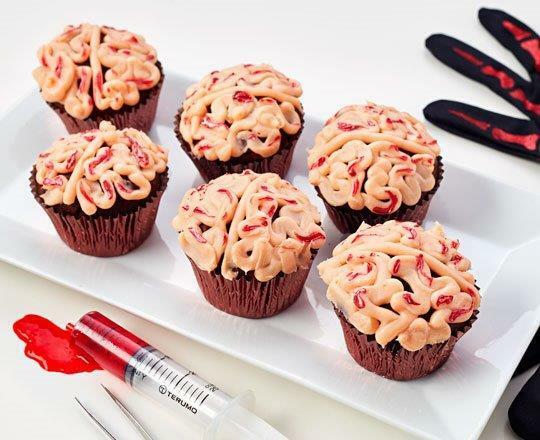 Spoon into a piping bag with a plain nozzle then pipe onto each cake to resemble 2 halves of a brain. Use writing icing to make blood vessels etc. Serve immediately or store, chilled, in an airtight container until required.